MILPITAS, CA--(Marketwired - Dec 3, 2013) - Sigma Designs® (NASDAQ: SIGM), a leading provider of System-on-Chip (SoC) solutions for home entertainment, control, connectivity and converging multimedia, has announced that LATAM STB manufacturers are engaging in production of a turn-key solution based on Sigma's SoC design for hybrid ISDB-T set top boxes (STB) for Argentina and other countries using ISDB-T.
Sigma will debut the STB (set top box) solution, which is aimed at LATAM's mid-range hybrid terrestrial markets that are primed for consuming content via broadcast or broadband, at the 2014 CES show. Middleware vendors and content creators have aligned in their efforts to deliver interactive entertainment to the end-user through connected TVs and STBs. The turnkey hardware and software STB solution is based on Sigma's media processor that includes an OpenGLES2.0 core and an L2 cache for more performance. The STB brings together OTT services via Wi-Fi connectivity and interactive terrestrial programming via ISDB-T/Ginga. 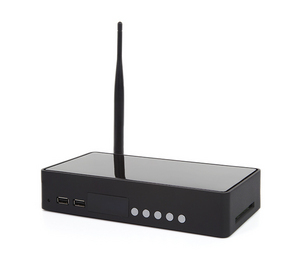 In addition, the built-in Wi-Fi enables the hardware to serve as an access point as well as a client. Sigma Designs is working with Mach Electronics, an industry leader in LATAM broadcast technologies, to market and manufacture the hardware locally in Argentina. "Mach is very pleased to be working with a partner like Sigma Designs to build this product as we share the same value of delivering high quality solutions to our customers," stated Nicolás Bloise, President and co-founder of Mach Electronics. "The cost optimized turnkey hardware solution will help OEMs to go to market on time and manufacture the product in Argentina with minimum R&D investment," commented Jose-Luis Martinez, CEO, B-Part Argentina s.r.l., a leading broadcast consultant to Latin American regulators and agencies. "In addition, this is the only solution currently available for Ginga 2.1 and browser capabilities that enables high-performance delivery of applications though a standard local broadcasting system." "The turnkey ISDB-T solution offers best-in-class performance for interactive broadcast standards such as Ginga.ar," said Mustafa Ozgen, Sigma Designs' vice-president and general manager multimedia business unit. "The partnership between Sigma Designs and middleware vendors has resulted in a highly interactive and cost-effective hybrid solution for the LATAM free-to-air market. Several STB manufacturers like to use the combination of Sigma's SoC and our turnkey Ginga solution. The initial deployment is targeted to the growing hybrid market in Argentina, where we are proud to say that we are the first to comply with the Lifia Ginga Test Suite 2.1. With multiple Ginga partners and ODMs, we can tailor regional middleware that meets the requirements of additional countries like Uruguay, Ecuador, Bolivia, Paraguay, Chile and others that use ISDB-T."
This press release contains forward-looking statements within the meaning of Section 27A of the Securities Act of 1933 and Section 21E of the Securities Exchange Act of 1934, including statements about the anticipated features and benefits of Sigma's products and solutions. Actual results may vary materially due to a number of factors including, but not limited to, general economic conditions, including the rate of adoption of Sigma's chipset solutions, Sigma's ability to deploy and achieve market acceptance for Sigma's products in its target markets, the ability of its SoCs to compete with other technologies or products in these markets as well as other risks that are detailed from time to time in Sigma's SEC reports, including its quarterly report on Form 10-Q as filed September 12, 2013. Readers are cautioned not to place undue reliance on these forward-looking statements, which speak only as of the date hereof. Sigma undertakes no obligation to publicly release or otherwise disclose the result of any revision to these forward-looking statements that may be made as a result of events or circumstances after the date hereof or to reflect the occurrence of unanticipated events.